FLOWER POT PEOPLE NURSERY ~~~~~~~~~~~~~~~ in Cow Watering Lane ~ Our GoY Wellie Olympic Team is under threat ! Latest discovery ~ The Flower Pot People are breeding inside Captain Grenville's Secret Training HQ. Recent paparazzi picture of the nursery. Well I just had to add it to my favs. I can look at it for a laugh. LOL. I need a laugh in this weather today. Please don't choke. We might need your help in stopping these sneaky Flower Pot People from multiplying. ! ! ! il do my best TT :D hows little Bonsia ? These are just the youngsters. There are a few examples of grown-up Flower Pot People on my fav. photos by Peter and Arlene. The 'famous' one in my photo has yet to be revealed. Who do you think it might be ? OMG! This has an air of Children of the "Corn" to it. Robotic pothead, sweet, innocent-looking kids with elimination in mind! This far supercedes germ warfare and testing on animals! How, on earth, can we "weed" out those flower-pot men, and ladies? (Only a guess, as observation-based assessment only. Crossed/uncrossed legs, and strategically placed leaves and hats). I have been forced to add this to my faves, too, lol! 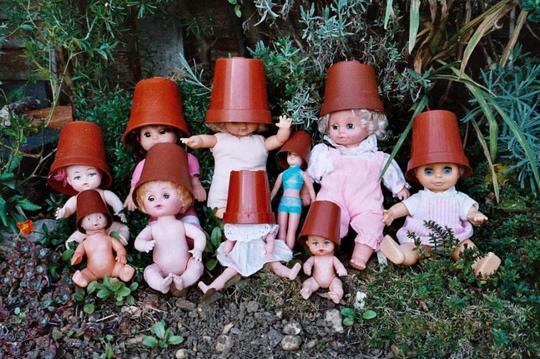 Good to know this picture is on members' favourites so that we can all keep an eye on the dreaded breeding programme of the Flower Pot People. TT! I shall release him at the earliest oppportunity! He will come out barking mad(ly), no doubt. that may be enough to scare the pots off 'em! There are male and female Flowerpot People. Male Flower Pot People are usually known by code names Bill and Ben. Once again, Terratoonie..you have made me laugh so much! Or at least cover them with a few leaves! need the tlc of Newfie Nurse. They made me think of Chucky! Beware those innocent-looking flowerpots - they are, en efait, les machines de brainwashing, a la Dr Who! Village of the Damned? Thank the Lord we got out of there and moved downtown! As for Eilidh's hairy pots, hmmm....not sure that they are robotic enough! May need some upgrading to "Braveheart" mix of centuries make-up, and movie-style licence, to really have effect! Love your potty-training train of thought, Newfie, btw! LOL..this is so funny!!! Innocent young Flower Pot People!!! I can send up some grass skirts for them if you like!!! :-) I've added this to my favourite!!! Good idea ! Grass skirts would be ideal for these young Flower Pot People, especially while they undergo potty training with Newfienurse. And which is your Wellie Sport Panther ? Ten pin bowling using a coconut? What wonderful Wellie Olympians you are ! Teaming together to combat our rivals. Excellent photo TT....in my favourites too. David is releasing furry Toto even as we speak. Will Toto be a match for Lara Croft ??? They reminded me of the music group from the eighties...Devo, lol! That's really interesting. I'd not heard of Devo before, so I looked up on Wikipedia ~ photo of a man with flower pot type thing on his head! Lol. Furry Toto has gone into hiding, as he fears the worst! Have uploaded his hardened sibling, the concrete Toto, in reserve! I fear that the furry sibling has gone into hiding, but will flush him out, no doubt! I'm really pleased you like this. Kind of you Terratooine, sometimes i plan to say one thing and it comes out something else, I have to be carefull. Fascinating you say that Aleyna because Skippy in Arizona sometimes worries whether a phrase which is amusing in the USA has the same meaning in the UK . Lol. Your Toto search is " Toto " lly commendable, but furry Toto MUST be found to guard us all. The Flower Pot People are spreading into the homes of many GoY Olympians. Check out Jacque's two latest greenhouse photos for confirmation. This foolhardy Flower Pot Person floated in during recent floods. We don't want them sabotaging our swimming and diving events. Furry Toto where are you ? Are you with Cluelesskev ?? I'm beginning to think so, TT. I can send in the Tin Man meantime if you like. Lion is too scared to come out of hiding in the loft, though! I'll start a search for furry Toto. Panther ~ Great idea ! The coconut shells for head protection ! I've made a note of your chosen sport and I'll announce it over on my Wellie blog. :o) You will be a gold medal winner in coconut pin bowling. Lol. I bet Newfienurse will grab at the chance of a holiday in Fiji. Please check out my Wellie blog later to accept your invitation to join the Wellie team. Lol. Check out the Flower Pot Toddler alert just sent to you from Jacque's blog. !!! How did I miss this ........... it must go on my favourite as well , I will definitely be keeping an eye out for any Flower Pot Toddlers in my Greenhouse , we have a nursery for young toddlers up the road I think I should go to check it out for copy cats babys sneaking into human homes ,.. It's no wonder you missed this earlier. You've been busy checking out your greenhouse and other gardening venues where Flower Pot People like to lurk. But have you looked in your airing cupboard recently ? I've heard there's a Flower Pot Toddler hiding in there with your pretty pussycat, Marmalade ! Check my latest pic. TT this is a much bigger problem than you think !!! Amy ~ I checked this out. A whole army of Flower Pot People, posing as scarecrows. I wonder if there will be more sightings. Hi TT - are you missing anything? I was clearing up the leaves in my garden and found some very familiar looking Flower Pot People in my wheelbarrow. Not sure how they got there - I wonder if they were blown in on the wind? If they are not yours, they are certainly clones although they seem to have found some underwear (probably stopped off at M&S on the way across country). Mind you, it has been chilly to be going around without BLOOMERS (how about that for a gardening link?) Have posted a photo so you can help identify the interlopers. I'll hop across and check it out. Do you think M&S or Matalan ? I think it,s under control TT... The gates have been closed They find it almost impossible to climb walls , there are security cameras everywhere ! ....... we willl call for backup if need be !!! Please check out Sid's latest blog. The FlowerPot People problems might be worse than you imagine.!!! a picture of a Flower Pot Person ??? The answer might surprise you ! ~~~ Look at my favourite photos for the answer. It was back in July 2007. This must, indeed, be one of the first pics of an alien lifeform to be posted on GOY! Darth Vader in disguise as a femme fatale - who may be alikened to the deadly Black Widow! BEWARE, everyone! The "host" is among us! David ~ you found the photo. Well done! Did you find it Ams ? Was it good enough for a Like or a Comment ??? Sorted TT, it all came flooding back. Terra – Is the famous one incognito Dennis, Beattrix or Harry Potter? Aternanthera if it is a spy who loved me it could be Barbara Bach. WARNING ~ NEWS FLASH FROM KENT. Look at the central flower pot on her picture. The eyes are on the spies. Amy ~ That's a super new tree. It seems the Flower Pot Toddlers have now invaded the nurseries and garden centres. When you buy a plant, you get a Flower Pot Person for free. Great photo! Though I think anyone new to this site must be wondering about the sanity of the people on here! whereas other forums seem to quite quickly lose their members. I don't think they'll stay very long unless they put some clothes on. There will be little Flower Pot People with frostbite everywhere. You are too funny girl. Have those pesky Flower Pot People reached Alberta yet ? Gilli found them indoors behind her potted plants, so maybe you should take a closer look around The Estates. Well if they do reach here I hope they are smart enough. The last time pot heads tried to enter Alberta the Traffic sign on highway just outside city limits stumped them. It read Edmonton next right and below that it read Calgary left. So they turned around and went back to where they came from. It's a joke LEFT, GONE, BYE BYE. You got one of those spy cams set up in here somewhere or does each pothead come with its own cam? I would have the colour adjusted on that cam, it's not pink it is a deep red wine colour. Pink YUK! There's a Flower Pot Toddler gone missing from the photo up there.